I like to think that folks were tougher back in Pioneer days. I don’t really know if that’s true, but it feels right. Consider the people who built Portland; just to get here, they had to travel by boat or train, hack down a mighty forest, then start all over on the edge of a wilderness. Courtesy of Steve Terrill photography. 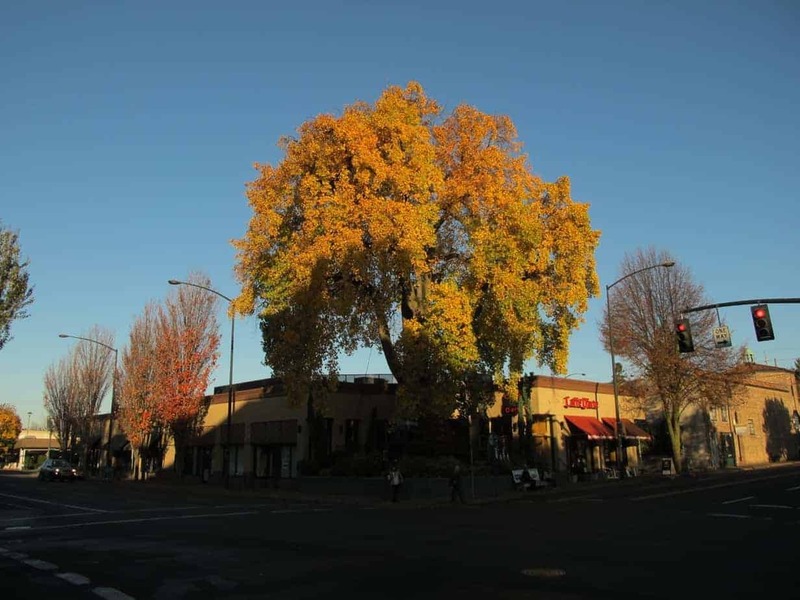 Portland Heritage Tree #2 sits at the corner of SW Park and Main, right where it’s been since 1880. And based on its species and history, it will probably be there for another 100 years. But at this corner, a man named Sylvester Farrell and his wife, Honor, built a house in 1867. Mr. Farrell was a leading businessman in town, and would become a city commissioner and state representative. In 1880 his friend J.N. Dolph, a US Senator, brought him a gift of five London planetrees — commonly known as a sycamore — from Washington DC. Somehow, the name got misspelled on this plaque! (photo courtesy of City of Portland). The story goes that Mr. Farrell wanted to plant all five on his property, but Honor objected, because she knew they’d get big and didn’t want them shading out the house and garden. So four went away as gifts (and are presumed lost), and this one went out by the street. As of today, that’s 134 years and counting. 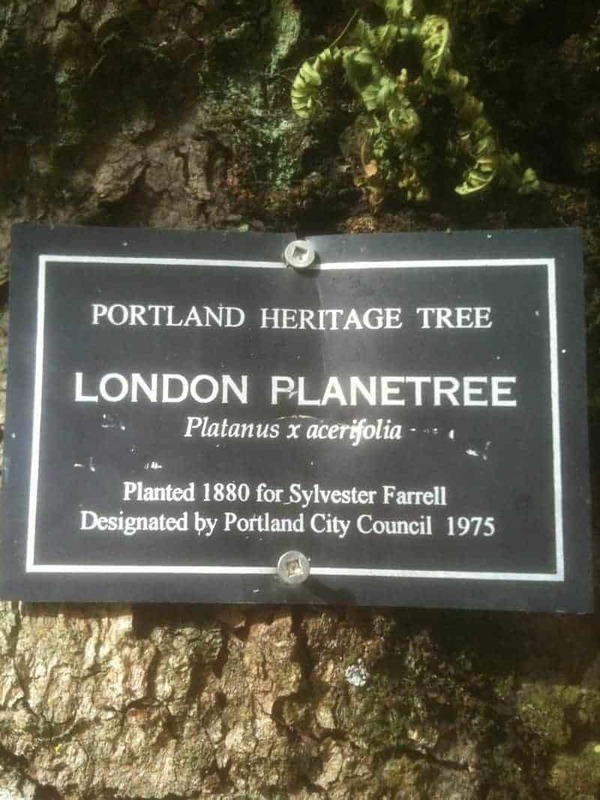 In 1973 the tree was designated a city landmark, and in 1993 it was one of the first eight trees to be designated as Portland Heritage Trees. 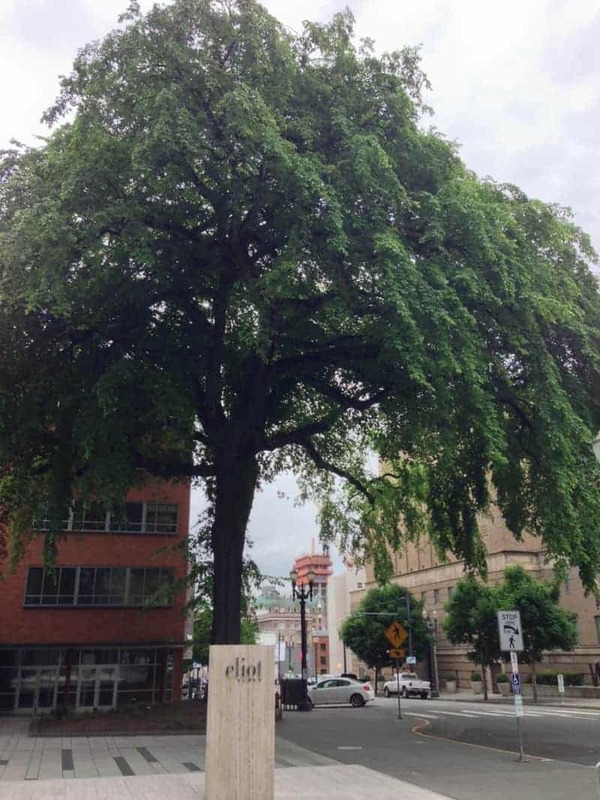 Each Portland Heritage Tree gets a plaque (photo courtesy of City of Portland). 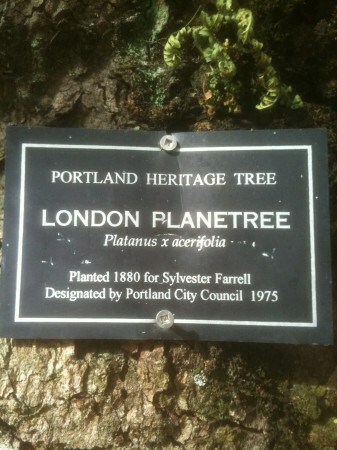 The London plane is a hardy tree, indeed. It can grow in a forest or the city, and it can get to 150 feet in height with a spread of 100 feet. 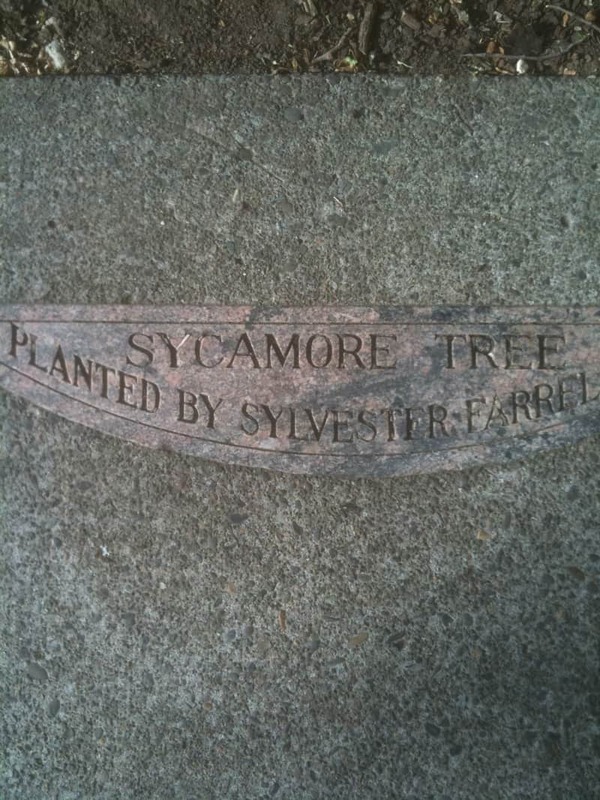 (This one measures just under 14 feet around, 60 feet high, and 70 feet wide) It’s actually a hybrid between the American Sycamore and oriental planetree. The first one took root when two of those trees were planted next to each other in London in the 17th Century. 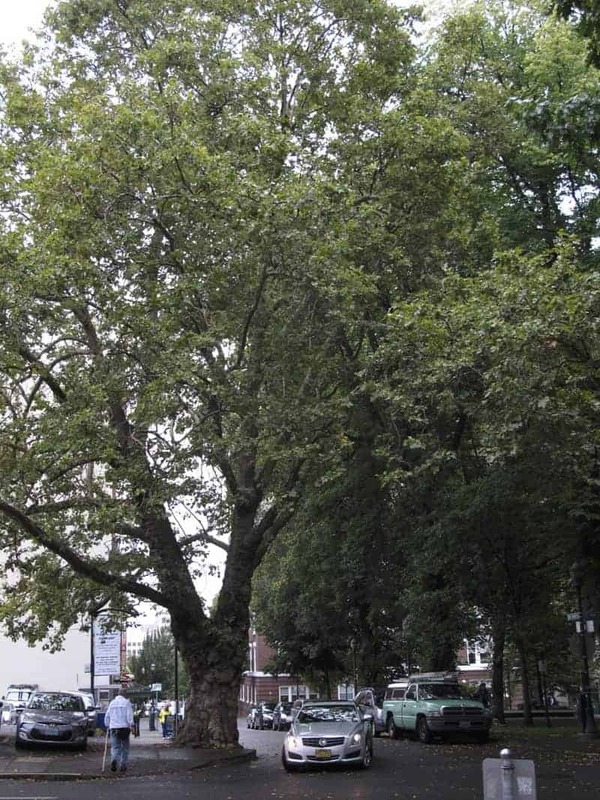 It’s a very popular city tree, and in fact there are London planes in Philadelphia that date to colonial days. In the forests back east, the American Sycamore is the biggest tree of them all. 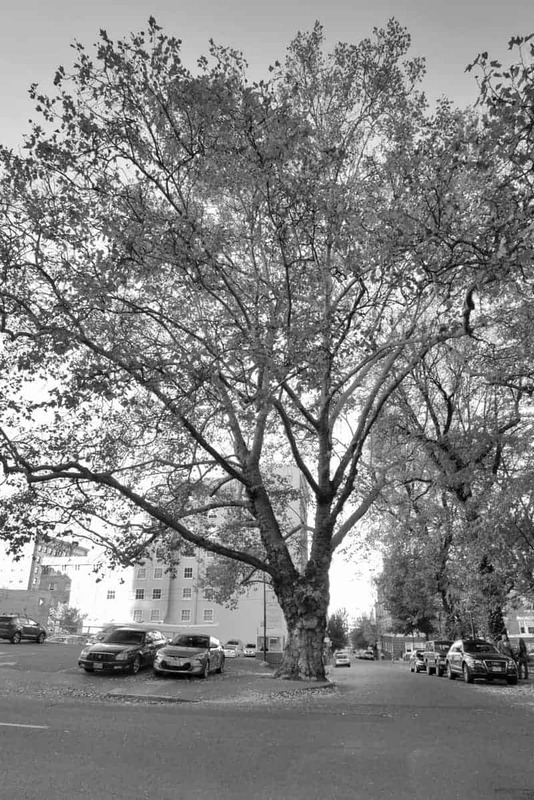 In fact, Portland decided in 1976 to line the new bus mall with London planes, each one limited by underground concrete and regular trimming so they don’t reach their full size. So you can walk down to SW 5th and 6th to make a comparison with this old tree. Once you notice this tree, you will always notice it. This one, in addition to being surrounded by concrete and buildings, has been through a lot, as well. Think of all the ice storms, wind storms, heat, cold, drought and floods! In 1880 the folks from First Congregational Church threw it a 100-year birthday party, and in 1984 two of Farrell’s grandchildren showed up to watch it get trimmed by an arborist. It isn’t colorful, but the bark is impressive. Be sure to check out how thick it is. (photo courtesy of City of Portland). The London plane isn’t much of a colorful tree — just sturdy and long-lasting. Its bark gets thicker with age and cracks as the tree grows. Its flowers are green and come out with the leaves in spring, so they are easily missed. Its fruit is more interesting, though; they are round balls about one inch in diameter and hang on little stems in late winter and spring, swaying in the wind. They also give yet another nickname to this tree: Buttonball or Buttonwood. Whatever you call it — and by the way, the plaque misspelled Farrell’s name — do stop and pay a little respect. Try to recall that when this tree was planted, it was at the edge of town. Give a little thanks to Honor for knowing where to plant it, as well as the city for saving it and taking care of it. And let’s make a nod to that old pioneer spirit, too. 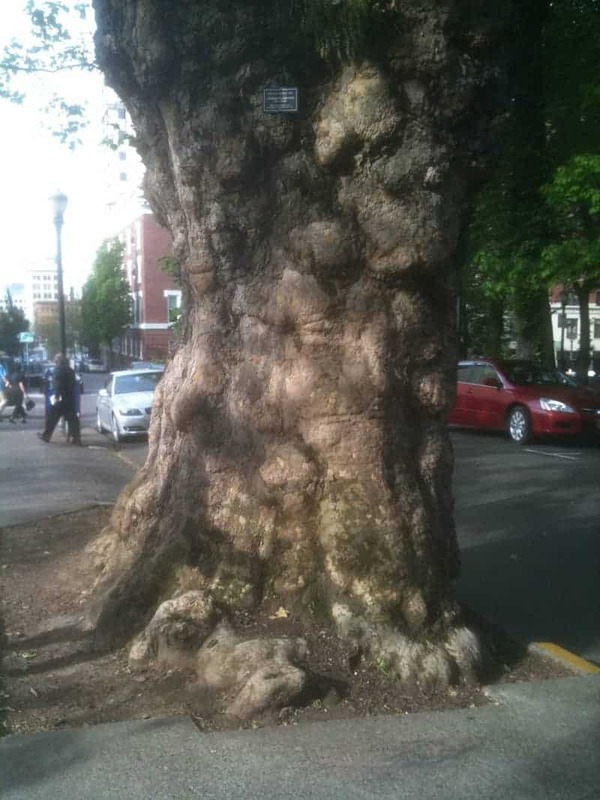 There are more descriptions of Portland Heritage Trees here. I am also writing a book about them, with photographs by Steve Terrill. Check out the breakfast blog at BreakfastinBridgetown.com.